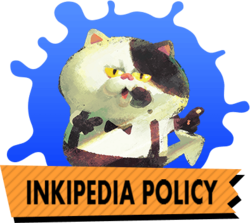 Here at Inkipedia, we strive to create a safe, friendly community for all visitors. Because of this goal, we have a strict policy that all users must follow. If you have any questions or concerns about our policy, please feel free to visit the discussion page or talk to an administrator. No inappropriate language, content, links, or discussions. Thank you for following these rules, and have a tenta-cool time! This page was last edited on 17 March 2019, at 23:49.